Many thanks to KUOW's Community Engagement Producer Kristin Leong and the KUOW Staff for editing my story! To read the edited version on their site click here. Below is my original, unedited story documenting my #KUOWCuriosity Club Pop-Up experience. As soon as the question left his mouth, my head instinctively swerved around and I chuckled while letting out a resounding “No!” When I applied to be part of KUOW’s Curiosity Club last Fall, I jumped at the chance to be part of a diverse group of thinkers living in Seattle. As I sat at the dinner table searching the faces of the other cohort guests; most shared my same look of bewilderment. In my desire to be part of the curiosity club community, I overlooked the idea that space would truly be made for all perspectives, and admittedly didn’t expect a question like this to be asked. I couldn’t figure out if my KUOW Curiosity Club Pop-Up cohort member was asking this to be provocative or if he actually thought the answer would be yes, but I didn’t hide my shock and surprise at this being asked in a non-rhetorical way. Never one to bite my tongue, I told him (and the group) that we could look at the current leadership in our country and strained race dynamics playing out every hour of every day, to answer this question. As a black woman working in media/tech in Seattle (and living in this country), conversations about race are ever present in my life and not something I shy away from. Exploring race during a dinner party with strangers was inside my wheelhouse, yet I didn’t expect to have this question posed to the group… and definitely not from a fellow person of color (PoC). I guess you can say this was one of the key moments that stood out during the inaugural curiosity club pop-up dinner and sparked curiosity within me - I couldn’t help but wonder if he actually believed we lived in a post-racial society? And if he didn’t believe this, why ask what could be considered such an unproductive question? 20 minutes into our KUOW Curiosity Club Pop-Up, I realized I live in a bubble. Despite having friends from various racial and cultural backgrounds, the majority of our beliefs are homogenous. I’d entered the dinner thinking highly of just how open-minded and opinionated I was, but quickly realized I found the “post-racial” question so jarring because it represented an opinion drastically different than that which I typically surround myself with. Deepening our conversation around race, I was delighted to hear KUOW reporter Patricia Murphy (she produced one of the stories we discussed) share that she’d handed over portions of the reporting of her story on 18 year old Millionaire Lavish (a black youth who detailed why he carried a gun) to a PoC man whom she felt would be able to better connect with Millionaire in a way she couldn’t and provide him comfort while sharing his story. Despite the piece not being one of my favorites of the night (I think there is a disproportionate amount of stories detailing the struggles of black youth, and not enough highlighting their resilience and accomplishments), sitting next to Patricia and hearing how she used her self-awareness, empathy and compassion to share Millionaire’s story warmed my heart. It should also be noted that she remained in touch with Millionaire and took a vested interest in him beyond just using him for a story. Compassion is where empathy meets action and we need more reporters like Patricia. 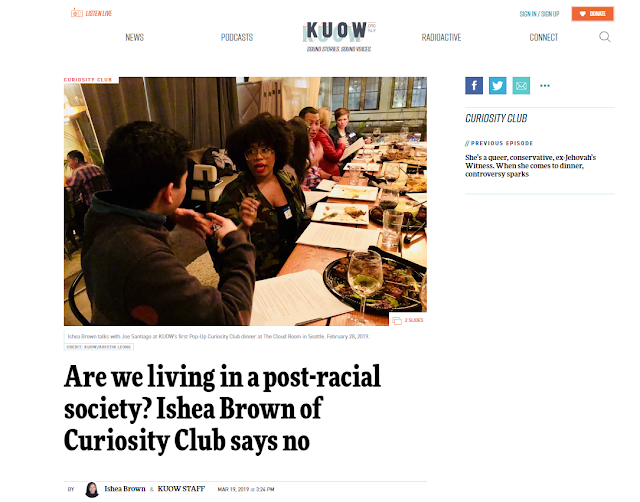 Created with the purpose of bringing together a group of strangers around surprising stories and great food, the KUOW Curiosity Club Pop-Up cohort had 1-night to see if we could transform ourselves from strangers into a community. KUOW’s Community Engagement Producer Kristin Leong did the work to bring us together, led the discussions and made space for everyone to share their stories... but ultimately taking the leap from strangers to community was up to us. 10 cohort members arrived as curious strangers with open minds, ready to be vulnerable and share our stories, but would we leave as friends? I’m happy to report back that not only did I hit off with a few cohort members and exchange info, but Dy and I got together a few days later for brunch! It wasn’t the biggest surprise for me that I hit it off with the only other black cohort member (which really shines a deeper light on the necessity of connection and community for PoC’s in Seattle). Dy and I realized we shared similar interests and knew mutual people, so it was a bit of a surprise we hadn’t met already… but I do credit the Curiosity Club for bringing us together and us for making the effort to get together afterwards. A wonderful reminder that you can lead someone to water, but you can’t make them drink… or more plainly, KUOW can create a great environment to meet new, diverse people, but it’s up to you to do the work to forge a deeper connection. As I venture back into the streets of Seattle, forever changed by my Curiosity Club Pop-Up experience, I carry the stories of my cohort and feel inspired to expand the circle of people I’m around, diversify the perspectives I expose myself to and continue stepping outside of my comfort zone with the events I attend. Make eye contact with and say hello to everyone you encounter in a day. What did you notice? How did it feel? When is the last time you went to an event or class outside of comfort zone? In the next week, pick a class or event to attend and set the intention to connect with and exchange info with at least 1 person there. The next step? Make (and keep) plans to hangout! Create your own curiosity club! Invite 3 people to dinner and ask them to each bring a curious friend! Put a variety of topics and questions into a bowl and have everyone pick a question during dinner to get the conversation going.